Mazeredo is a Brazilian artist from Rio de Janeiro whose works have been displayed in Brazil, Europe and major US cities. Recently, she was honoured in Paris, where her Dialogue exhibit was on display at the festival Le Lavage Du Madeleine. When Pope Francis visited Rio in 2013, he personally blessed her St. Francis and White Dove sculpture, which then went on public display at Lido Square in Copacabana. She started her Dialogue for Peace sculpture series in 2013 to generate awareness that dialogue between cultures through art plays a crucial role in fostering peace and understanding. The white sculpture represents the dove of peace. The two red and green sculptures symbolize a butterfly (freedom) and two lips (dialogue). 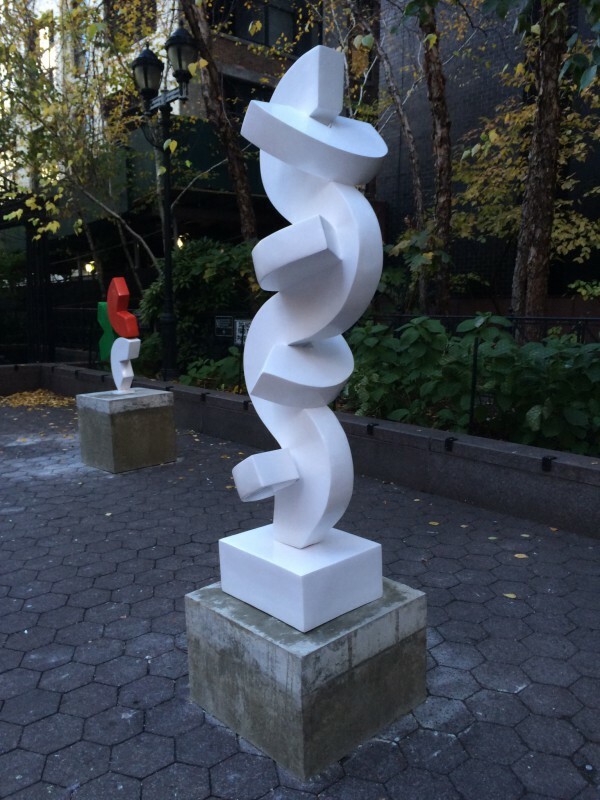 Notice how the pieces of white sculpture interlock and connect. This entry was posted in Art & Sculpture On View, News, Sculpture by Anne Hersh. Bookmark the permalink. Website developed by Partnerships for Parks, a joint program of NYC Parks and City Parks Foundation.